Royal Engineers, Sapper 145822, a skilled lithographer. 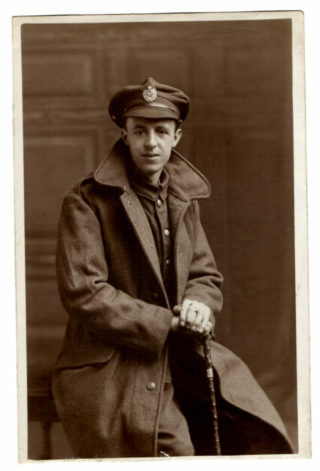 Sapper Herbert Porter, a studio portrait taken probably soon after he enlisted in December, 1915. Courtesy of the family archive of Rosemarie Greenhalf. 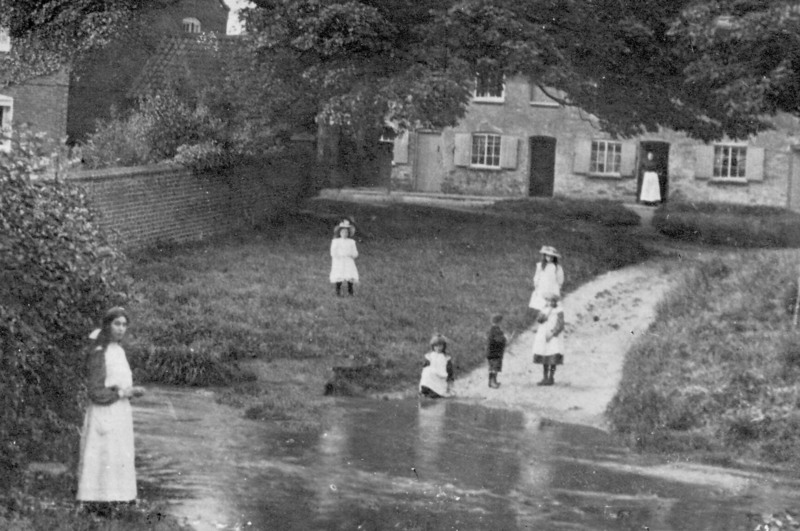 From an old postcard, children at the ford on The Green, Bottesford, c.1900: Frances Baker may be one of them. 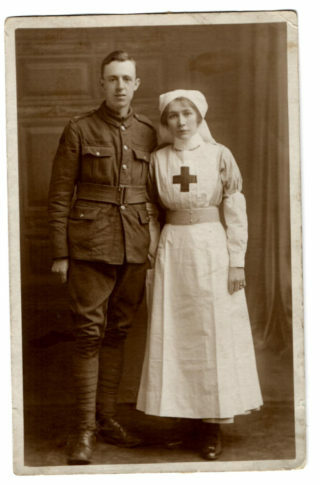 Herbert Porter and Kathleen Porter in uniform, taken probably soon after they married in January, 1916. Courtesy of the family archive of Mrs Rosemarie Greenhalf. Kathleen Porter in her nurse's cape and uniform. The cap badge displays the Red Cross of the VADs. 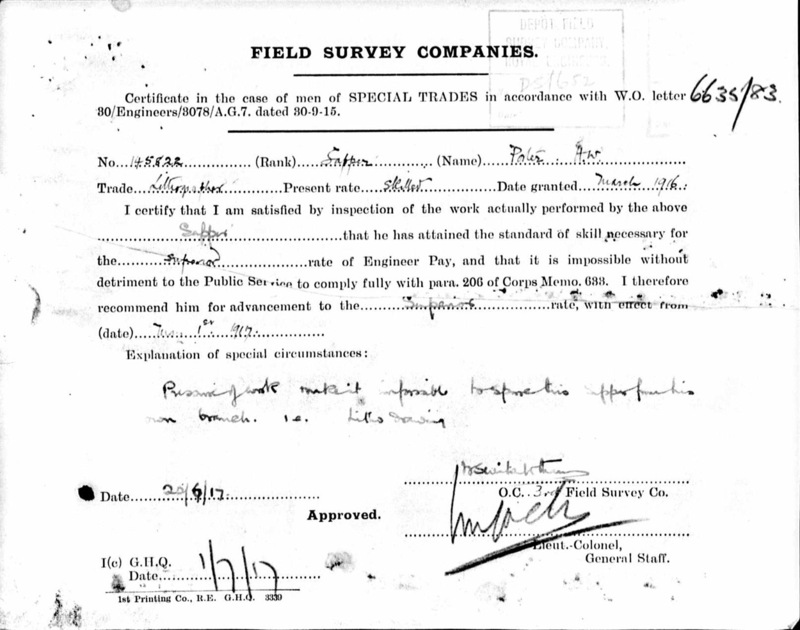 Field Survey Company form, setting out the case for granting Herbert William Porter superior engineer pay in 1917. 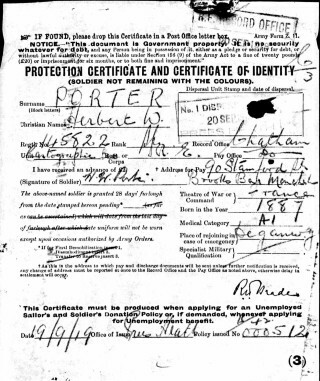 The outside of the Herbert Porter's permit for access to the Printing Works. By courtesy of the family archive of Rosemarie Greenhalf. 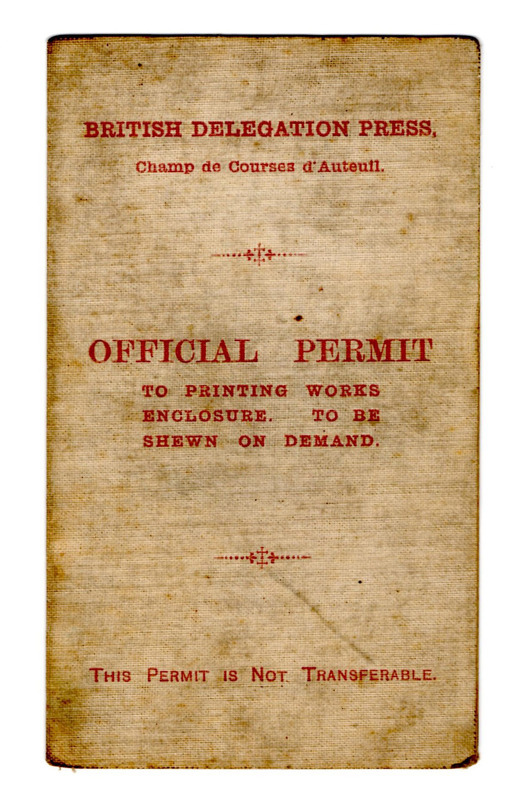 The inside of the Permit issued to Herbert Porter for access to the Printing Works. The date is not shown, but it is signed by Sapper Porter and by Major William Stanford, RFA. Herbert William Porter is one of the men named on the Bottesford ‘church list’ of WW1 Servicemen. 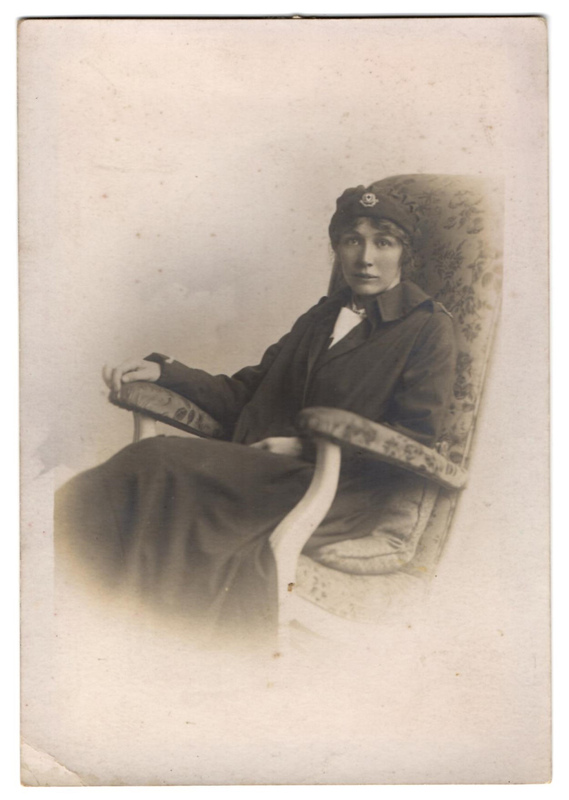 He married Frances Kathleen Baker of Bottesford in St Mary’s parish church, early in 1916. Mrs Rosemarie Greenhalf is thanked for allowing us to add photographs of Herbert and Kathleen in their uniforms as a Serviceman and a VAD nurse, respectively, and information about her grand-father’s life and work in Liverpool after WW1. Herbert William Porter was born on the 26th October, 1887, and baptised on the 4th December, 1877, at St Matthias, Sneinton, Nottingham. 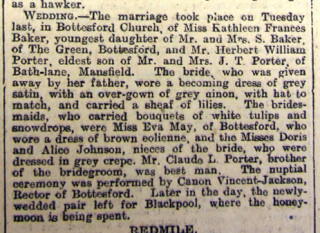 He was the oldest son of John Thomas and Frances Amelia Porter of 22, The Promenade, Nottingham. 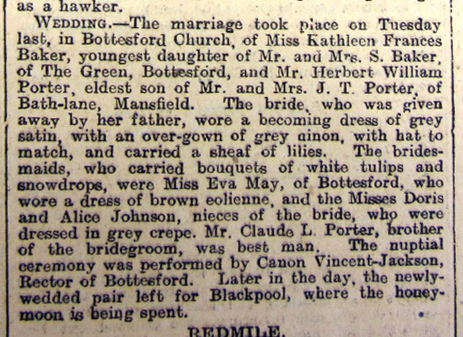 John Thomas Porter and Frances Amelia Tebb had married in St Matthias’ on 23rd December, 1886. In the census of 1891, Herbert William Porter is at his family’s home at 45 Pym Street, Manvers, Nottingham. His parents were John Thomas Porter, a 28 year old lithographic artist from Sutton Valence, Kent, and Frances, aged 32, from Caistor in Lincolnshire. They had two children at this time, Herbert William, aged 3, and Claude Leonard, aged 1. By the date of the 1901 census, the family had moved to 21, West Field Lane, Mansfield. Then in the census of 1911, they were at 27, Bath Lane, Mansfield: John Thomas Porter, aged 46, a lithographic artist in printing; his wife Frances aged 52; Herbert William, 23, a lithographic artist in printing; Claude Leonard, 22, also a lithographic artist in printing; Thomas Stanley, 18, a ‘fine’ printer. All three sons were born in Nottingham. Frances Kathleen Porter was born in 1892, at Bottesford. 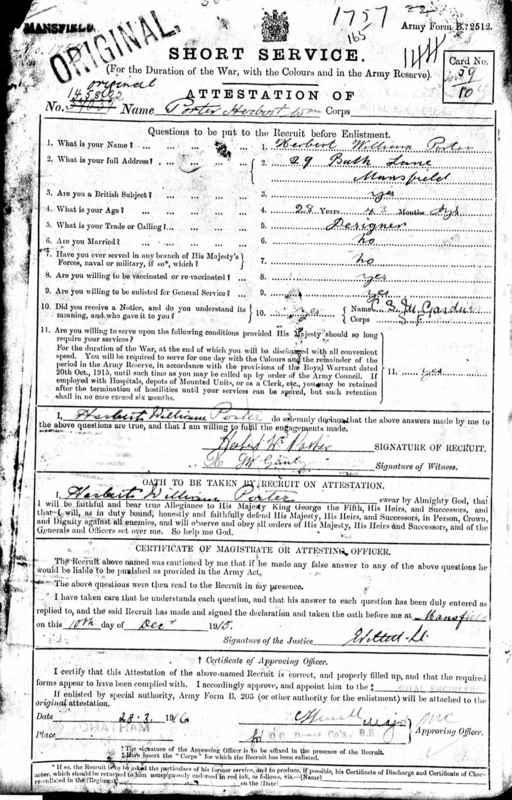 In the 1901 census, Frances C Baker, who was born 1892 at Bottesford, lives at 7, The Green, with parents Samuel and Hannah Baker, and grandmother Mary Baker. Samuel was a railway foreman plate layer born 1861 at Sedgebrook, Lincolnshire; Hannah was born 1858 at Tuxford, Nottinghamshire; Mary, aged 77, was born about 1824 at Barrowby, Lincolnshire. In the census of 1911, Samuel and Hannah Baker live at 11, The Green, but Frances was not with them on census night. Now aged 19, it is possible that she had left Bottesford, but her whereabouts at this time have not been identified. It may be that she had found work at Mansfield, where she met her husband to be. 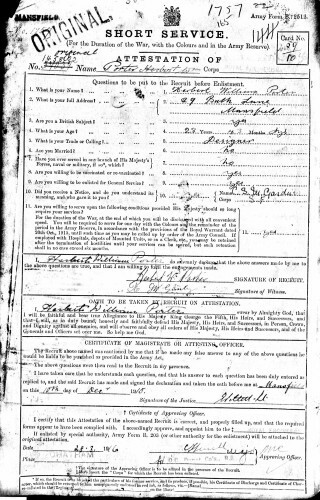 On his Attestation paper dated 10th December, 1915, he (service number 145822) described himself as Herbert William Porter, a 29 year old “designer”, single, from 19 Bath Lane, Mansfield. 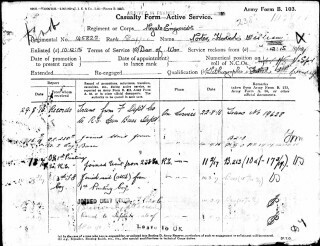 The Casualty Form – Active Service (B.103) – confirms that he enlisted on the 10th December 1915, a month before he and Frances Baker married. It records that he joined his unit (238th Coy, RE) in France on 14th September 1916, then transferred to the 1st Printing Company RE on 11th February 1917. 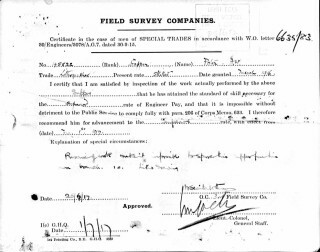 The ‘Field Survey Companies’ form tells us that in March, 1916, he was placed on ‘skilled’ pay rate for a lithographer, and that he was recommended for the ‘superior’ rate of Engineer pay to commence on 1st January 1917. 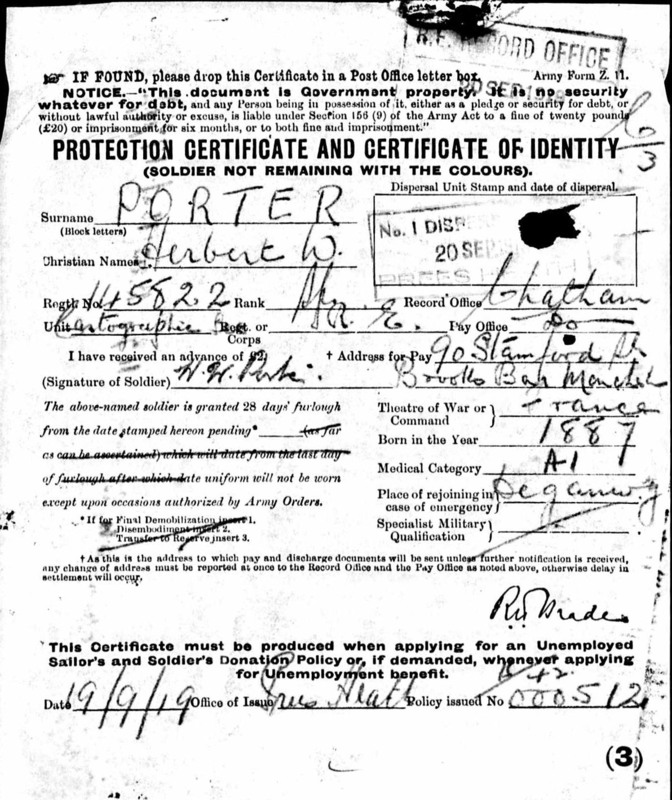 The ‘Protection Certificate and Certificate of Identity’ tells us that Porter, Herbert William, Sapper 145822 of the Cartographic Corps Royal Engineers, theatre of war France, had given his address for pay as 90, Stamford Road, Brooks Bar, Manchester, and his Place of Rejoining in case of Emergency as Deganwy (referring to the Deganwy Army Camp, opened 1915, used by the Durham Light Infantry, Royal Field Artillery, the ‘Salford Pals’ of the Lancashire Regiment and the Royal Engineers: historypoints.org). Rosemarie Greenhalf has provided images showing the two sides of a Permit issued to Sapper 145822 Herbert Porter giving his access to the “Printing Works” as part of the British Delegation. The Permit is not dated, but Mrs Greenhalf relates that she has been told that it allowed him in to the signing of the Treaty Of Versailles, though she is unable at present to verify that this is true. The Permit was counter-signed by Major William Stanford of the Royal Field Artillery. Wikipedia introduces its long article on The Treaty of Versailles with this summary: [The Treaty] was the most important of the peace treaties that brought World War I to an end. The Treaty ended the state of war between Germany and the Allied Powers. It was signed on 28 June 1919, exactly five years after the assassination of Archduke Franz Ferdinand. 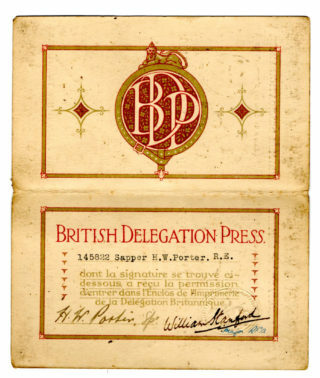 Although the armistice, signed on 11 November 1918, ended the actual fighting, it took six months of Allied negotiations at the Paris Peace Conference to conclude the peace treaty. The treaty was registered by the Secretariat of the League of Nations on 21 October 1919. 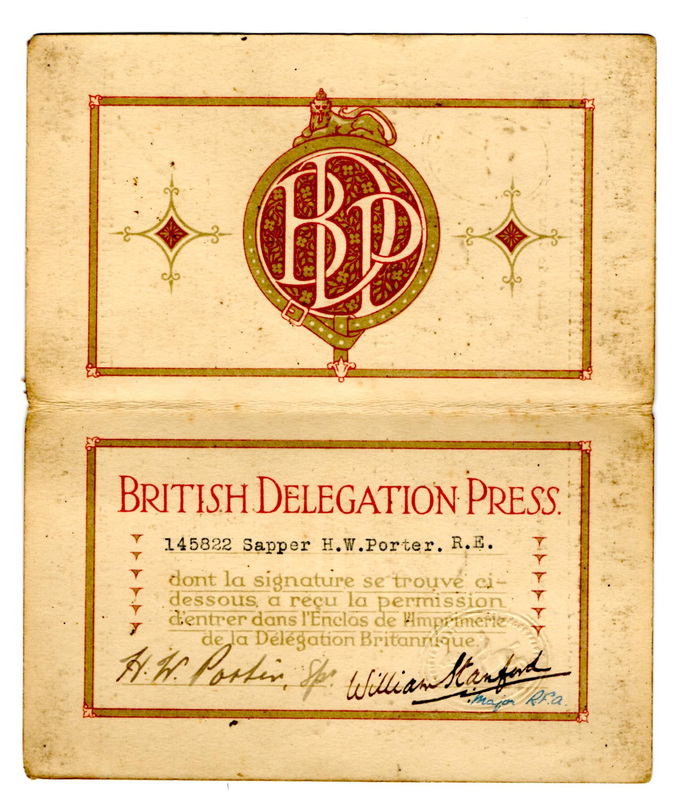 Herbert Porter had specialised skills that could very well have been valuable in performing the ‘back room’ work in compiling the Treaty and its associated documents, so the Permit could indeed relate his contribution to this important process. The wording is bi-lingual, which is consistent with the contention. 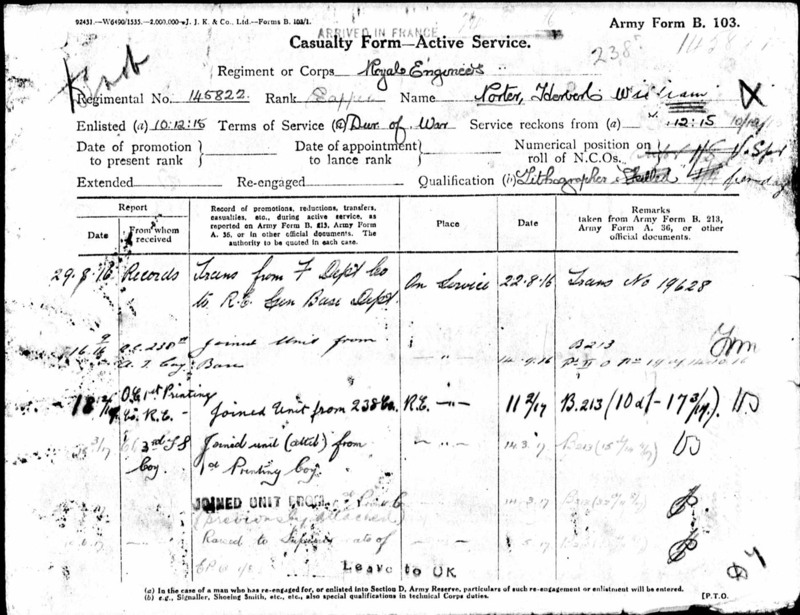 Herbert Porter was demobilised at Chatham, 17th October, 1919. 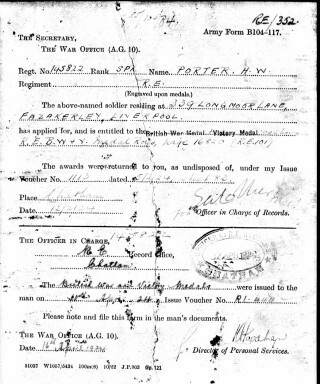 Army Form B104-117 records that Sapper 145822 Porter H.W., residing at 339 Long Moor Lane, Fazakerley, Liverpool, was entitled to British War Medal and Victory Medal. 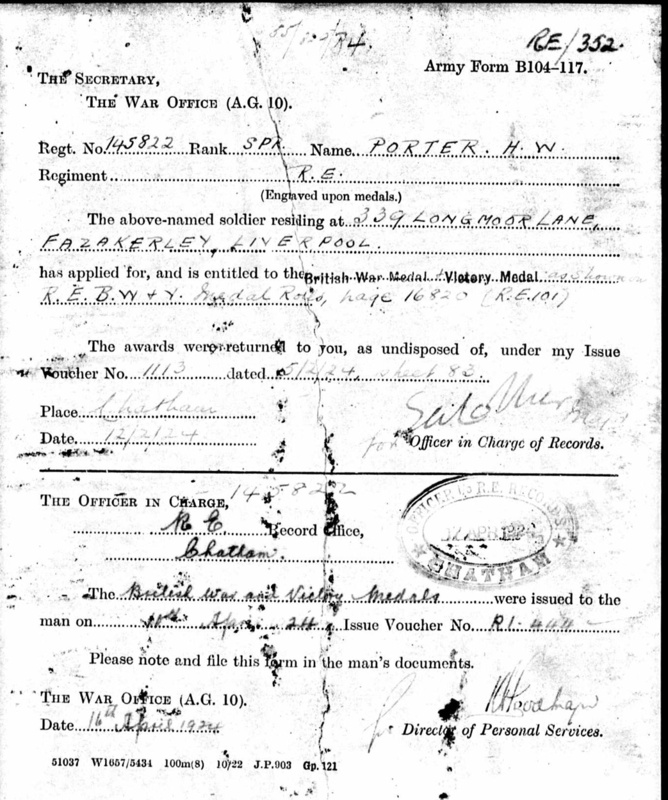 His service records indicate that he had an address in Manchester later in the war, and that he had another address in Liverpool by 1924. Rosemarie Greenhalf, Herbert Porter’s grand-daughter, has kindly provided the following information. Herbert Porter lived in Liverpool with his wife at 339 Longmoor Lane initially, then they moved to 20 East Orchard Lane. He worked for Metal Box company in Liverpool as a Lithographic Artist designing biscuit tin lids. He moved to Lily Cups (Liverpool) after that, again working as a designer for waxed paper drinking cups, chocolate box lids, biscuit box lids. He retired from there and continued to live at the same address, 20 East Orchard Lane, until he died in on 4th June, 1972. His ashes are scattered on Plot 29 in the Garden of Remembrance, Liverpool Crematorium, Anfield. Kathleen his wife died 5th February 1986, her ashes are also on the same plot. Their daughter Marjorie, Rosemarie Greenhalf’s mother, was born in Manchester in 1921, and sadly died 2001. They also had a son named Kenneth, born in Liverpool in 1926. The General Register of Births, Marriages and Deaths confirms that a Herbert William Porter, born in 1877, died in Liverpool in 1972. He was aged 85.